Qutub, N., Sabir, S. (2012). Optical, Thermal and Structural Properties of CdS Quantum Dots Synthesized by A Simple Chemical Route. International Journal of Nanoscience and Nanotechnology, 8(2), 111-120. N. Qutub; S. Sabir. "Optical, Thermal and Structural Properties of CdS Quantum Dots Synthesized by A Simple Chemical Route". International Journal of Nanoscience and Nanotechnology, 8, 2, 2012, 111-120. Qutub, N., Sabir, S. (2012). 'Optical, Thermal and Structural Properties of CdS Quantum Dots Synthesized by A Simple Chemical Route', International Journal of Nanoscience and Nanotechnology, 8(2), pp. 111-120. Qutub, N., Sabir, S. Optical, Thermal and Structural Properties of CdS Quantum Dots Synthesized by A Simple Chemical Route. 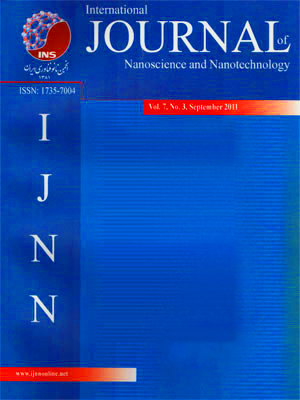 International Journal of Nanoscience and Nanotechnology, 2012; 8(2): 111-120. The present work deals with the synthesis and characterization of CdS nanoparticles with good thermal stability and optical properties by a novel and simple synthetic route. The nanoparticles were synthesized via chemical precipitation method in a single reaction vessel under ambient conditions. The prepared CdS nanoparticles were compared with the bulk CdS. The Optical properties were determined by using UV-Vis spectroscopy. The band gap from Absorption Spectra was found to be 2.66eV (470nm) while that of bulk is 2.42eV (515nm). Thermal properties were determined by DTA, TGA and DTG. The particles show good thermal stability with high melting point (~12500C). Structural and Morphological properties were analyzed by FTIR, XRD, SEM and TEM. The XRD pattern exhibit features of cubic crystal structure having morphology of octahedron and tetragonal phases. The particle size calculated from UV-Vis Spectroscopy, XRD and TEM was well below 10 nm.